Editorial: Caregiver - Patient: Can We See Eye to Eye? Biomaterials for the Reconstructive Treatment of Periodontal Intrabony Defects. The aim of this paper is to present a critical overview, with emphasis on the evidence from human histology, on guided tissue regeneration, different types of biological agents and various combinations used in regenerative periodontal therapy of intraosseous defects. The available evidence indicates that surgical periodontal therapy employing the use of guided tissue regeneration, enamel matrix proteins or growth factors may result in periodontal regeneration. However, it is yet unknown to what extent a combination of guided tissue regeneration, enamel matrix proteins, growth factors and various types of bone grafts or bone substitutes may provide additional histological and clinical benefit. Periodontal surgery is an essential part of modern periodontal therapy. Selection of the appropriate incision technique is one of the main preconditions for a complication-free healing process involving minimum esthetic impairment. This applies not only to periodontal surgery but also to oral surgery and implant surgery. The different surgical incision techniques are described in detail from this aspect. Instructions on tissue management aimed at minimum traumatization are discussed from macrosurgical and microsurgical points of view. The crucial factors here include inflammation-free tissue, maximum exsanguination, sharp surgical instruments, atraumatic, non-contaminable suture material, and the shortest possible duration of surgery. This case report demonstrates minimal invasive regenerative therapy using enamel matrix derivative in a patient with chronic periodontitis. The microsurgical approach using a modified and simplified papilla preservation technique in an intraalveolar 2-wall bony defect was effective in the regeneration of periodontal soft and hard tissues. The minimal-invasive technique enabled primary wound healing with minimal recession and considerable attachment gain after 6 months. Treatment Strategies in the Case of Advanced Attachment Loss. In adopting a treatment strategy with the objective of conserving strategically important teeth with advanced attachment loss in order to avoid possible complications in the case of prosthetic restoration, all clinically relevant therapeutic possibilities should be utilized. The main focus is on the treatment of teeth with horizontal bone loss down to the apical third of the root with deep, often only one-sided vertical bone defects , through-and-through furcations with considerable defect height, as well as combined periodontal and endodontic inflammations. This article describes cases which show that it is possible to conserve critical teeth over many years without progressive bone loss, but that complications may endanger its long-term success due to endodontic factors, furcation caries, and root fractures. Hence, the implementation of this treatment strategy demands an active conservation therapy in order to control these complications. 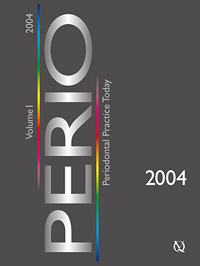 The successful periodontal treatment of an advanced, generalized, chronic periodontitis is illustrated, discussed, and documented over a period of 13 years by means of a specific patient case example. This case presentation illustrates the systematic treatment and follow-up of a 55-year-old heavy smoker with advanced chronic periodontitis. The goal of the treatment was to arrest the progression of periodontitis and the restitute of normal function by reconstructing the occlusion. After the initial phase of treatment a surgical phase with hemisections and extractions of teeth was performed. The fixed prosthetic rehabilitation of the case was implemented without the use of dental implants. Patient follow-up was documented for two years after completion of therapy. Extraction of impacted third molars is a well-established and documented procedure. Guided tissue regeneration can be used to aid in wound healing and increase osseous tissue formation. To assess the regenerative treatment outcome, several variables are routinely used; these include primarily histology and direct measurement of bone. Other proxy measurements, such as radiographic analysis, clinical attachment level and periodontal pocket depth are commonly used. This report describes the use of an ePTFE membrane following extraction of an impacted wisdom tooth, and the subsequent use of bone scan using Tc99m-Methylene Diphosphonate (MDP) to monitor the regenerative response. Before new treatment concepts can be used in daily practice, a critical analysis of the present scientific literature is necessary. The concept of full-mouth disinfection (FMD) was introduced as a new alternative treatment for the non-surgical therapy of inflammatory periodontal diseases, and is becoming more and more popular in dental practice. The following article provides a short survey and evaluation of the present scientific evidence about full-mouth disinfection. The concept of full-mouth disinfection includes scaling and root planing within 24 hours combined with an adjunctive chlorhexidine chemotherapy aimed to eliminate bacterial reservoirs in eriodontal pockets and in all oral niches. Scaling and root planing within 24 hours but without the adjunctive chemotherapy - called full-mouth scaling (FMS) - is another newly introduced strategy for the treatment of periodontitis. For the present review, 9 original publications of clinical studies were analyzed, in which a total of 118 patients with chronic or aggressive periodontitis were treated. Bleeding upon probing, the reduction of probing depths, changes of attachment level, and analysis of the bacterial microflora were used as markers to compare the different treatment modalities. Based on the present review, no evidence was found that full-mouth disinfection or full-mouth scaling could improve the clinical results of periodontal treatment compared to conventional scaling and root planing. Currently there exists no evidence for a change in a paradigm in periodontal treatment from conventional non-surgical therapy to full-mouth disinfection. Three years ago the Vector™-system was introduced to the European market for ultrasonic periodontal treatment. The manufacturer claimed that the system removed root cementum and periodontal soft tissues less aggressively than hand instruments. Furthermore, the treatment with the Vector™-system was claimed to be less painful than treatment with conventional systems, as vibrations applied horizontally to the root surface were avoided by a specific oscillation pattern. In addition, by changing the different insert tips of the handpiece, it is possible to use the device not only for periodontal treatment but also in restorative dentistry (i.e. minimal invasive preparation). Several studies assessed the properties of the device, and evaluated its possible benefits especially for periodontal debridement and supportive periodontal care. This survey reviews the current use of the Vector™-system for periodontal therapy.